It's a darn good thing I don't make a living knitting socks. Anyone following the saga of my version of SOS '08 Wendy's Seaweed Socks done in STR Hot Flash by BMFA will probably feel my pain here. I think the Plantar's Fasciitis has done me in. Beautiful, isn't it? I LOVE this heel...it's so darn pretty. It's the FIFTH time I've knit it (okay, not quite, I caught myself this morning when I made my forth attempt, before I'd gotten to this lovely slip stitching of the heel and ripped out the mess I was making of the short rows. At least I didn't have to go back too far. But. Five times I've attempted this. The foot was too short originally. I did add to it. This time, I suspect I shouldn't have knit the gusset deeper (I went to the medium). The length is fine, tho'. Still, perhaps there's a pattern here - five doctor visits from Monday thru Saturday, five times knitting this heel? lol! Can you read that ruler? Can you read this one? Sigh. 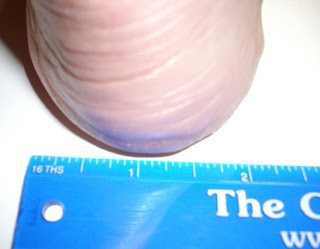 The heel is WAY too wide for my foot. There's too much fabric to be comfortable in my shoes. 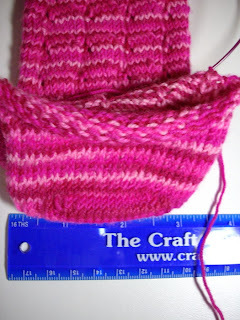 I will commence ripping, and will knit the heel using the heel I know fits. It has taken me way too long to knit these socks (and this is just the first one!). This time, I'll knit what I know works...and keep the pretty lace pattern. I just have to laugh. Crying makes not a whit of sense. And after all, it's JUST knitting, right!?! Yes, I always feel free to insert the toe and heel I know and love. In fact, I knit even Wendy's sock patterns cuff-down. Rebel here, happy with results. Yes -- keep chanting "it's just knitting", sometimes it helps (although not always). I say go for the heel that you know works; I generally knit my own heels and toes into my socks, since I know what tends to be right for me. The yarn is gorgeous, and I know you'll love them when they're done! Oh that is so frustrating! I've been knitting a sweater & have started it over 5 times too! Oh how frustrating. 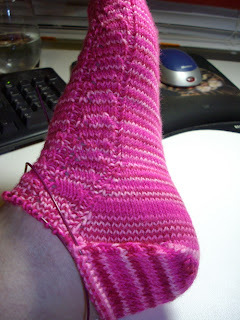 I wonder if smaller needles for just the heel would have worked. And A Very Busy Sunday!